Since the beginning of the summer I’ve been heavily involved in by institution’s introduction of a pilot of lecture capture technology. So far I’ve been hugely impressed by the software we’ve decided on from Panopto. This week I attended a conference run by Panopto at Senate House in London, and was intrigued to see that the debate had moved on from just recording all lectures to the concept of the ‘flipped classroom’. Whilst the idea goes back as far as Eric Mazur work in the 1990’s, it was in the early 2000’s that genuine discussion appeared of the idea pre-recording materials for students to watch before attending a teaching session. Indeed, the Learning & Teaching management of my own institution seem really keen that we move towards flipping our classes. As an aside, for anyone considering lecture capture software, Panopto is an excellent solution. I’ve been very pleasantly surprised as to how robust the software is, and how easy it is to use. Flipping is not an end in itself. What you do in the freed up time is everything. Practise something constructive. For large cohorts I would recommend peer instruction. Peer instruction is so much more effective than ‘lecturing’ it becomes a reason to free up time, a reason to flip. Having lived through the era (error) of ‘Learning Styles’, I think I’m just naturally sceptical of anything that is ‘the next big thing’ ! I particularly worry about how I would ‘police’ social loafing in a class of 200+ 1st years. I can completely see the argument for wholesale flipping of final year classes, when the aim of teaching is critical analysis rather than the imparting of information, but I worry that in other circumstances the quality of the flipped material is just as important as what occurs in the freed-up class time. Interesting stuff. I think Betteridge’s Law of Headlines applies to this post, though: I use the flipped classroom, and in answer to “Is the ‘flipped classroom’ the answer to all our problems ?”, I would say no! I’d also be very wary of anyone who claimed it always was. I’m not terribly interested in ideology, I’m interested in what works. If flipped class works in your context, use it; if it doesn’t, don’t. 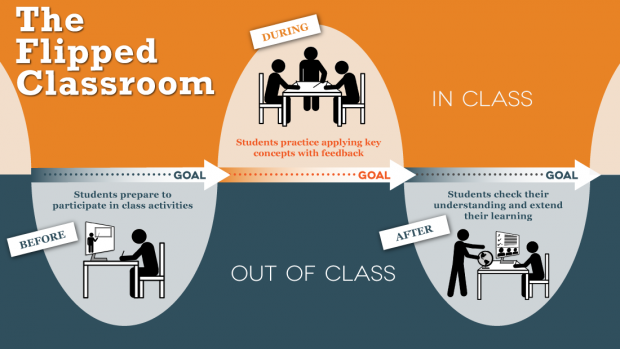 When I talk to people who puzzle over what to do in the freed-up class time, often I discover they are already pretty far down the path to what I would describe as the flipped classroom anyway. I think the reason that STEM folk are so enthusiastic about flipping is that STEM lectures are probably some of the worst of the genre. In some cases, they really are an exercise in turning 200 people into human photocopiers for 50 minutes, and I’m not exaggerating there. It doesn’t surprise me that there’s push-back to that sort of thing. I’m not that keen on labels, so my philosophy is this: are you making the best use of your precious contact time, and if you’re not, what would be better? Also, I’m in full agreement with you over the importance of modelling the academic process. I think that’s one of the most important things we can do. Transfer of factual information is relatively easily flipped; process is much harder. That’s what I use my contact time for, and flipping gives me the space, time and opportunity to do that. Guilty on the headline, i spend a lot of my time encouraging students to read further than the headline and first paragraph, and so tend to be over-dramatic out of habit ! Thanks for the link, it’s a really intersting paper, which i’ll circulate around my colleaugues here. What do you think about the impact of individual student motivation on the flipped classroom ? I remember some years ago listening to Steven Schwartz, the then VC of BRunel saying that problem-based learning only really worked with highly self-motivated students. Student self-motivation is key: I’m very up-front with my students at the start of the semester that the onus is on them to do what is needed or things won’t end well for them. By and large, they’ve been pretty good on that front. There’s research that shows students pick up very quickly on what the classroom norms are, so long as you stick to your principles and don’t accommodate people who don’t do the prep (by “quickly going over the main points” at the start of a class, for example). That said, realistically, I think student self-motivation is the key in *all* classroom approaches. Sure, people might be able to cram their way through a traditional course, but do they still have the knowledge, understanding and skills they need the next year? I couldn’t encourage you more strongly to give flipping a go, even if it’s just for a trial session or two initially. I’ve never looked back. Come to think of it, I can’t think of anyone I know who has.